The Bermuda Zoological Society in partnership with the Sea Turtle Conservancy completed another research and education programme this year, with the Bermuda Turtle Project committed to the goal of promoting the conservation of marine turtles through research and education. “During the 2018 research session the BTP team captured 259 green turtles and 1 hawksbill turtles at study sites around the island. Among the capture were 91 turtles [35%] that had been previously tagged, most in the same site as their original capture,” a spokesperson said. “One animal, first tagged near Tudor Hill in 2002, was recaptured 16 years later, on 14 August 2018, at Wreck Hill, just a bit north of the original tagging site. 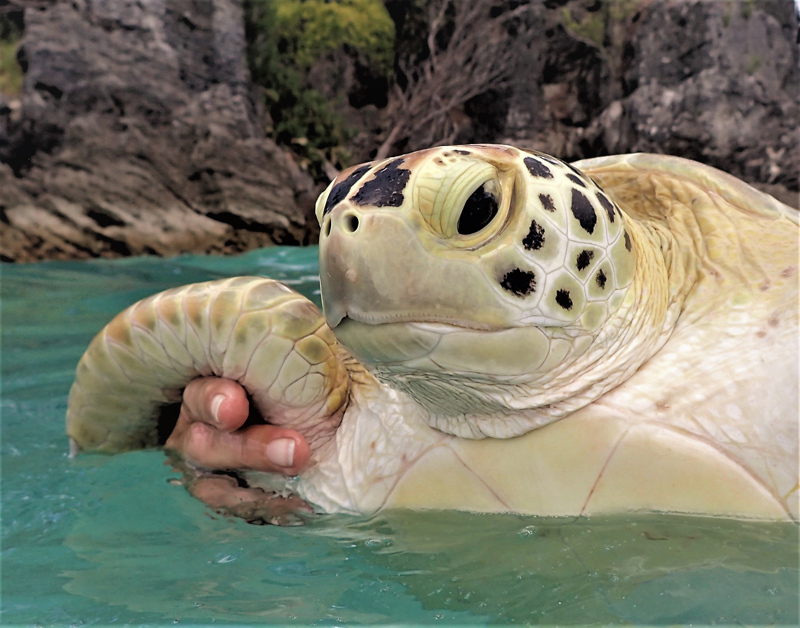 On 23 August 2018, the BTP captured a young green turtle that had been rescued on 2 August 2012 when it stranded near Jew’s Bay Dock having swallowed a fish hook. “After surgery to remove the hook and rehabilitation, it was tagged and released at Shelly Bay on October 3, 2012. The BTP has subsequently captured this turtle three times [2013, 2014 and 2018] at Bailey’s Bay during annual sampling sessions. By 2018, it had grown 11 cm! This was a lucky turtle. 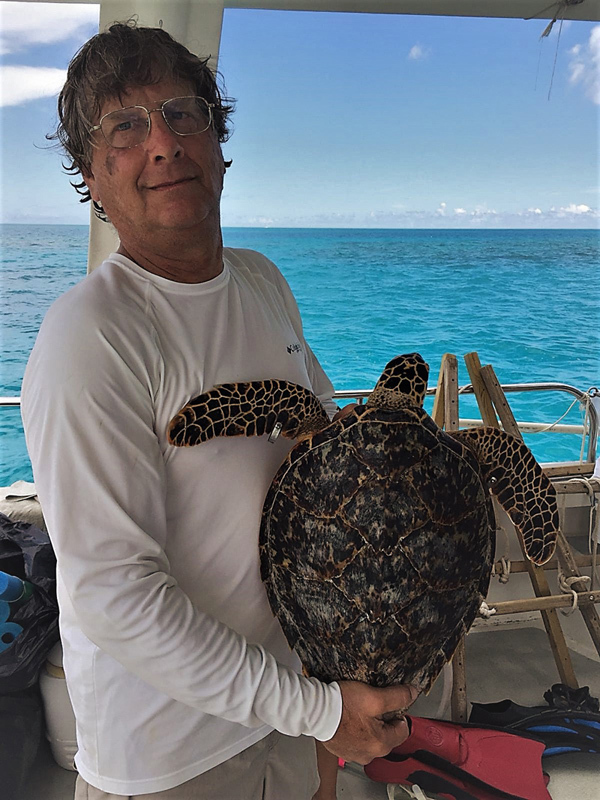 “Two large turtles had satellite transmitters attached to their shells in our effort to learn more about the movements and habitat use of sea turtles. Named Jubilee and Soirée these two green turtles are sending strong signals and their daily movements can be followed by visiting here. 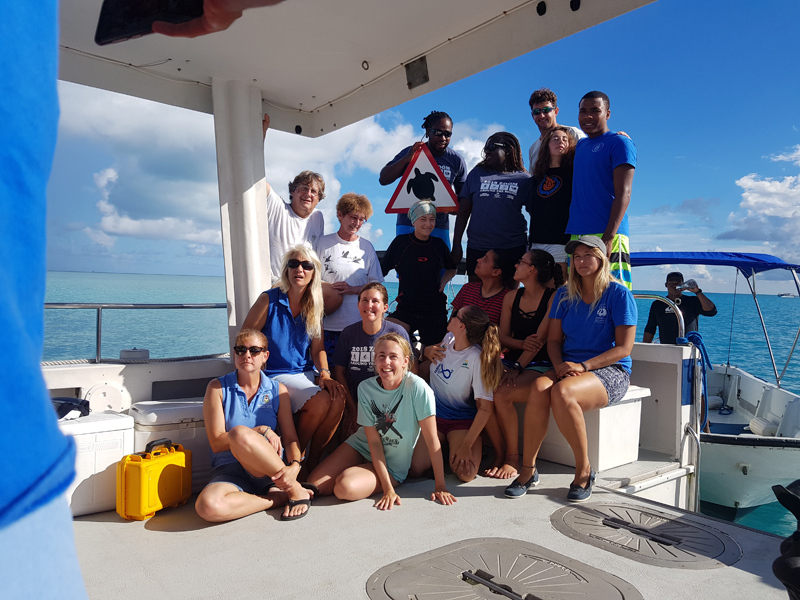 “In pursuit of our mission to protect sea turtles through research and education BTP runs annually an In-Water Course which brings students to Bermuda to learn about sea turtle biology and conservation. 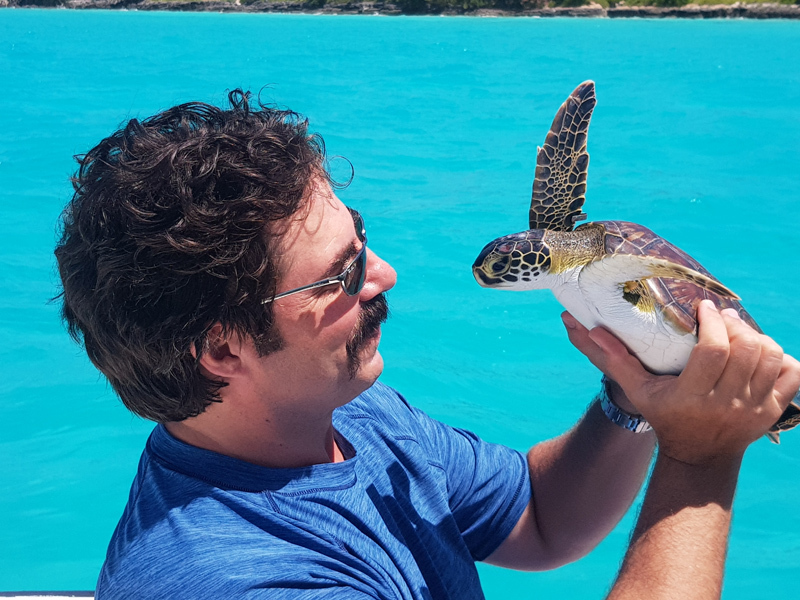 “BTP is building capacity and enhancing relationships with overseas jurisdictions, particularly, those with responsibilities to help manage the source populations for Bermuda’s turtles. “Participants this year included environmental officers and biologists from Belize, Bermuda, Brazil, Colombia and the US. 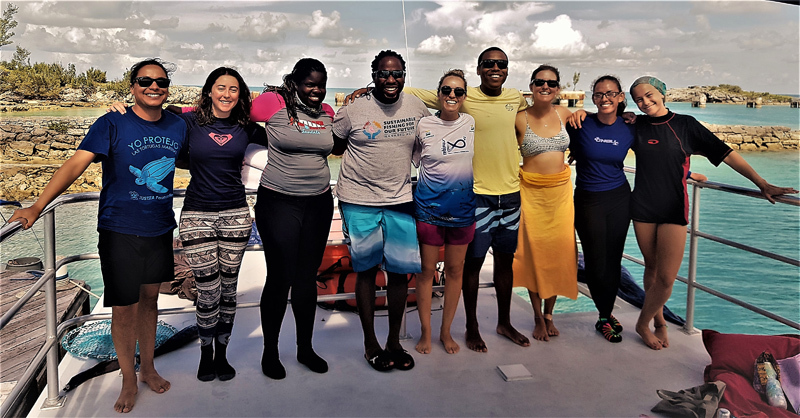 “These young scientists and biologists gained valuable experience in a range of field methods, reviewed and discussed 20 scientific papers, attended evening lectures and performed necropsies on 12 animals received by the Bermuda Aquarium Museum & Zoo stranding network. “Over the 22 years of running this course BTP has shared hands-on experience, knowledge and expertise to 206 students from 40 jurisdictions including many Bermudians. “The Bermuda Turtle Project [BTP] continues work envisaged by Dr. Archie Carr and initiated by Dr. Clay Frick of the Caribbean Conservation Corporation and Dr. James Burnett-Herkes of the Bermuda Aquarium in 1968. 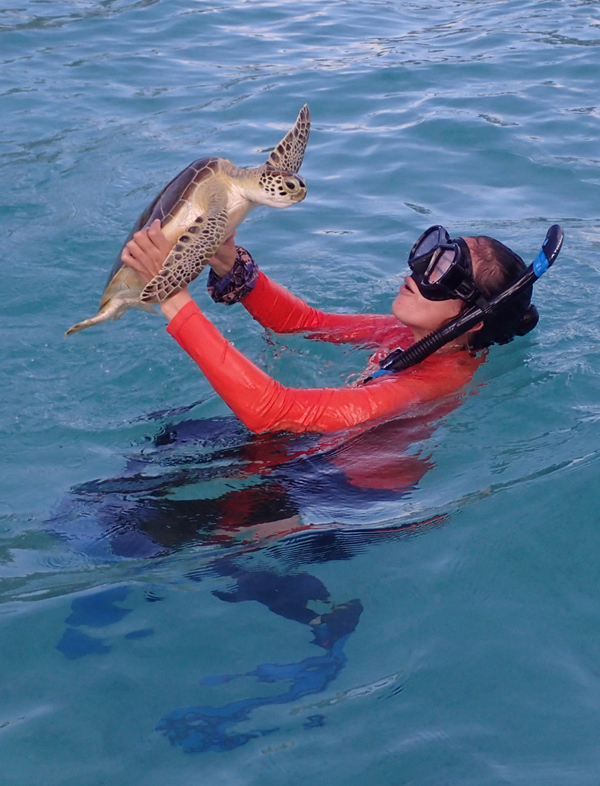 “Now in its 50th year, the project has grown from strength to strength, committed to the goal of promoting the conservation of marine turtles through research and education. 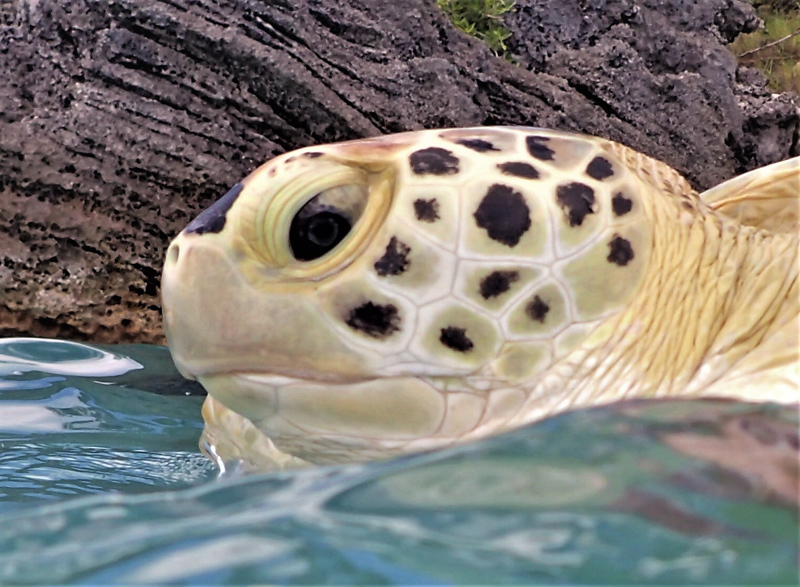 “In addition to discovering the year-round presence of green turtles and hawksbills, long-term consistent monitoring tells us that sea turtles arrive in Bermuda at a very young age and spend up to 20 years, as juveniles, on our beautiful seagrass flats and reefs. “Genetic analysis shows these young turtles hatched on beaches in Costa Rica, Florida, Mexico, Cuba, Surinam, Aves Island, and as far away as Guinea Bissau in West Africa. “Turtles tagged in Bermuda and subsequently documented overseas tell us they make long migrations when they leave our shores for the coasts of USA, Mexico, Nicaragua, Costa Rica, Panama, Columbia, Venezuela, Grenada, Saint Lucia, Dominican Republic, Haiti, Cuba and the Bahamas. “Bermuda-tagged turtles seen nesting on beaches thousands of kilometers away in Costa Rica, Mexico and Florida suggest it takes many more years, almost 2 decades, before they are mature enough to nest after their decades growing up in Bermuda. “The most powerful message from our findings is that sea turtles are a peaceful shared resource crossing many geographic and political boundaries. Vigilant management, protection and international cooperation throughout the region is essential to long-term survival of the species. “To support its mission to secure a sustainable future for one of the most valued sea turtle research, education and conservation programmes in the world, the Bermuda Turtle Project is hosting the ‘Sea Turtle Soirée’ on Friday, November 2nd at O’Hara House, 1 Bermudiana Road from 6:30pm-11:30pm. “Mix and mingle! Interact and enjoy! Explore and taste delicious food from around the world, all paired perfectly with a large selection of wines courtesy of Goslings. A six-foot hammerhead shark spotted cruising close to the shore is unlikely to be a threat to humans, marine experts said yesterday. Yet another video of a shark has gone viral, this time with footage appearing to show the shark coming in close to shore at Shelly Bay Beach. After meeting Dr. Ian Walker at a Bermuda Tourism Authority event, Rhona Emmerson was able to arrange for her group of artists - the Plein Air Society - to take a trip out to Trunk Island for a morning of painting on Sunday, 22nd April. In the early morning of Monday, 28th May, Roma Hayward, Animal Care and Quarantine Officer, released our first rehabilitated longtail of the season. On Wednesday, 28th March the students of the two Mount Saint Agnes' grade 3 classes held their "TOAD-ally Terrific tag sale", a fundraising event for the Amphibian Project which is supported by the Bermuda Zoological Society (BZS). After the two-day event, the students were able to raise over $1,300 for the Amphibian Project.